Defend the Cake Blog – Defend the Cake! 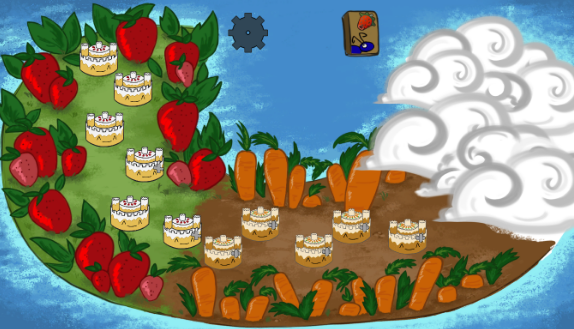 Get ready for a trip to paradise for the third environment in Defend the Cake. Filling the ocean side reaches of the cakedom are giant pineapples and sand castles. The Eggbirds are a bit topsy turvy after making the boat ride to the island chain and have built the cake upside down! Using local ingredients they created a delicious pineapple upside down cake castle – one of my favorite tropical treats! It is suspended above the sands, but it is still within reach of the hungry riff raff. In Pineapple Paradise water laps at the edges of your kingdom. 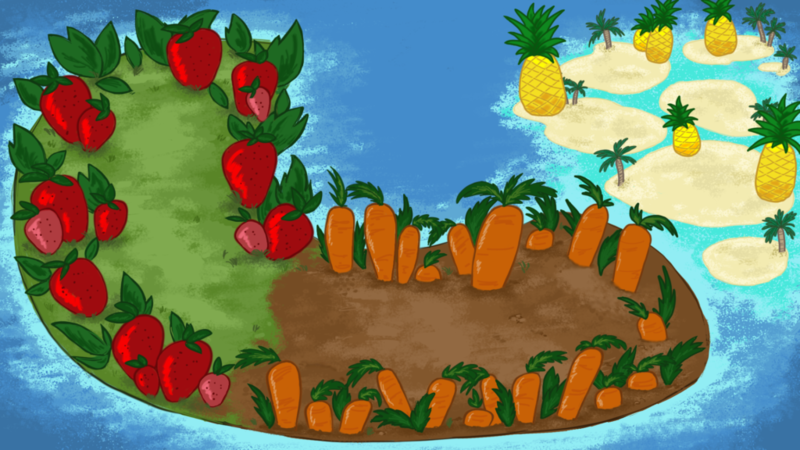 Building on small islands which make up the archipelago of Pineapple Paradise you have less space, and must plan your defenses more carefully. Interlocked by bridges the King commands that there be a path to your cake from the docks. The bugs still crave those delicious slices and will try and get them as soon as the Eggbirds relax from a day in the tropical sun. So no sleeping quite yet, your cakedom needs your vigilance. Hungry critters from all across the lands come seeking a slice of your cake. Its reputation as a bastion of deliciousness has spread all over the land attracting new creatures. These pilgrims of palate have risen from the warm waters and been recruited to the bug army. 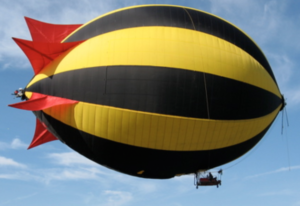 The bugs have invested into research and development, expanding their suite of tricks. 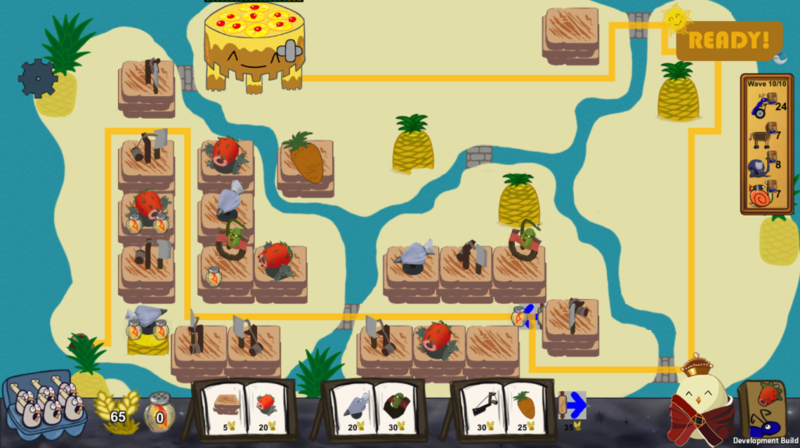 Chop down mighty pineapples to find a perch for your punishing defenses. Toast stacks of bread, ward off waves of warring ants while watching wistful waves. It’s slice to meet you pests, we’ve flipped our strategy. Prepare to punish petulant pests as you protect your purchase in this pristine pineapple paradise! That sketch hit all the right notes for us, and the Carrot Launcher was born. Establishing the visual direction also turned out to be crucial for moving forward on this design, which I had been stuck on. “Carrots that behave like missiles” gave me a specific feel to design towards, and gave me a launching point for the powerup ability. As soon as we had established this as a missile launcher, “Macross missile spam” immediately came to mind as a fun visual reference for the powerup ability. 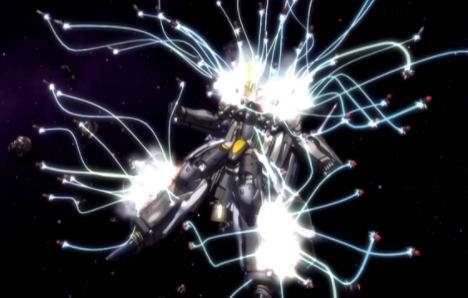 and fire a bunch of missiles to create a series of explosions in a line. I implemented it, played with it, and it felt cool, but after a few playtests I started to realize there was a problem. 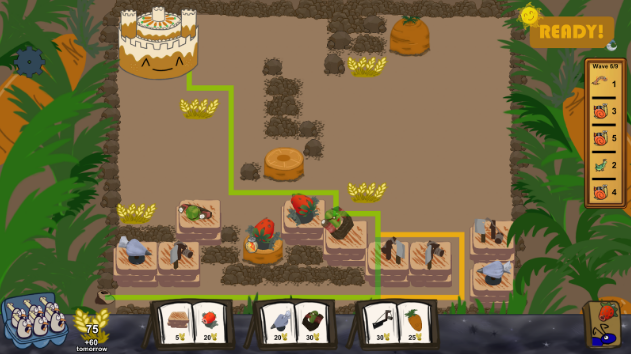 One of my primary design goals in Defend the Cake is that each tower should have a sharp and clearly defined role. While this first iteration was effective against swarms of Bees, it wasn’t nearly as effective against the new enemy being introduced in the same level the Carrot Launcher first appears: the Drone Bee. 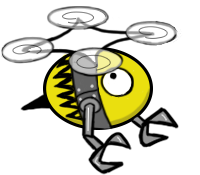 Drone Bees have 5x the HP of normal Bees, so the explosions that felt awesome against Bees would barely scratch the Drone Bees. I didn’t want to just amp up the damage, because I didn’t want the player to be able to build one Carrot Launcher and instantly be able to wipe out an entire wave of Bees with one shot. There are only a few flying enemies in the game, so if the role of the tower is anti-air, it better feel awesome against all flying enemies. I went back to what I started with. Is there a way of combining line targeting with firing a bunch of missiles, and make that feel fun and effective against all flying enemies? I didn’t have an answer at the time, so I decided to sleep on it. The next day, I had something new to try: the player targets with a rectangle, and then the tower fires a bunch of missiles and distributes them amongst the enemies targeted. It worked great! Targeting felt good, and a single Drone Bee gets hit by all the missiles for a ton of damage, while a swarm of normal Bees each get hit by a missile or two. It also felt more unique as the Watermelon already had a circular AoE ability, and the first iteration of the Carrot Tower felt too similar. The fact that it was no longer AoE also allowed me to increase the damage per missile, making it feel more impactful, without being massively more effective against larger swarms. Do you like carrot cake!? Your next destination on your journey through Cakedom is the Carrot Farm. 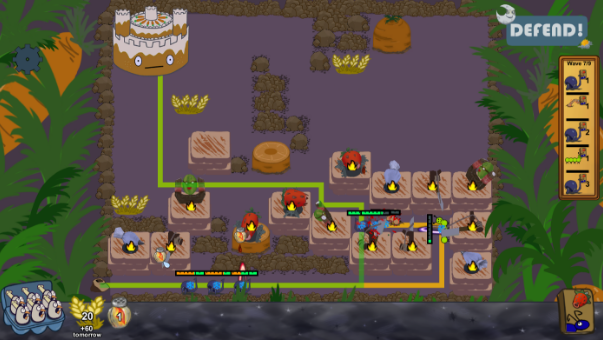 Chop the top of growing carrots to create stumps for your towers and defend your carrot cake from new creatures. We’ll also be introducing 2 new towers to add to your collection of defenses! Much of the game’s environment art was inspired by the foodscape works of Carl Warner, particularly this piece with tall carrot trees. 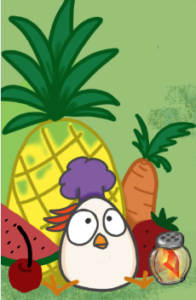 We imagined if you lived in a food themed world that it would be covered with oversized vegetables. We started with sketches of the Carrot Farm on the world map and concept art, then moved on to creating the in-game environment dirt tiles, rocks, carrots, and leaves. Justin is the gameplay designer and programmer behind Defend the Cake. Level design, mechanics, strategies, numbers, that’s all him! He got his start working in QA at Blizzard, and eventually became a Technical Designer on the Starcraft 2 team. He helped ship Starcraft 2 Wings of Liberty, and went on to be the first person working full time on the project that became Heroes of the Storm. He lead the HotS Technical Design team until he left Blizzard in January 2015. Justin has been playing tower defense games since the Warcraft 3 custom map days, and felt inspired to explore maze building as a central mechanic after being disappointed that so few modern tower defence games allow the player to shape the path. Justin does a lot of cooking at home, and is especially proud of his breakfast burritos, and chili. In his free time, he enjoys creating DJ sets of video game remixes. Toli is the technical artist for Defend the Cake. Those deliciously animating towers, toasty walls, and dancing creeps are just some of his creations, along with directing the shapes and color theory of the game. His love of strategy games was fostered by Homeworld and Warcraft 3. This brought him to Riot Games where he built tools and made maps but craved a smaller canvas to build creative visions upon. Toli spent a year learning to conjure pies, culminating in apparating a pie on the side of a mountain in the snow. Making sweets is his passion and sharing the fruits of his labors with friends brings a smile to his face. The first physical Defend the Cake cake was baked by Toli in celebration of the official company formation. His work on Defend the Cake is inspired by cooking, and the food that he encounters on his adventures. Often found learning to make new things, from baked goods to visual effects. He is always hungry for knowledge, learning how to use new tools and techniques helps him drive forward in creating new things. In his time away from Cake, he can be found building worlds in DnD and diving into content creation for VR. Naomi is the creative designer who is responsible for bringing the flavor and personality to the world of Defend the Cake through concept art and sprites. 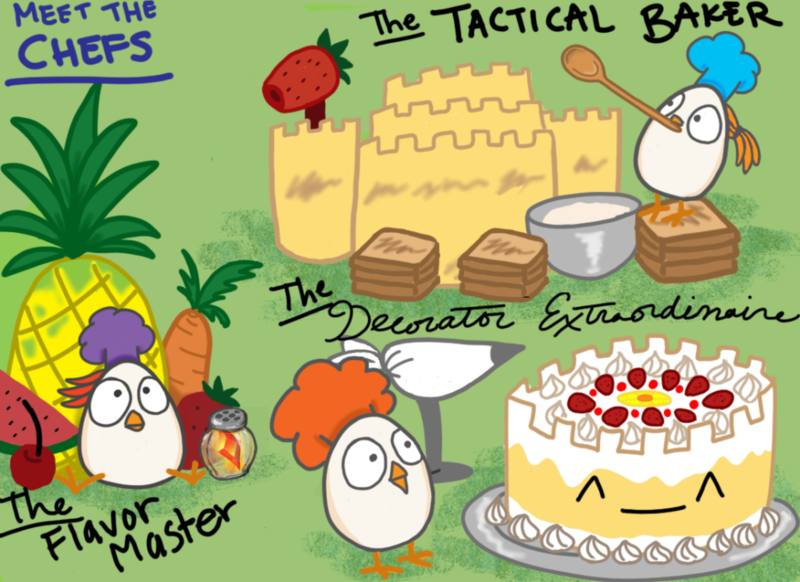 The Eggbirds, Cakefaces, and the fruity environment art are her doing. Her love for StarCraft and Warcraft 3 mods made her want to create a small polished tower defense game that was accessible yet strategic. During her time at Riot Games and Blizzard, she was a producer for internal tools and release engineering teams. When she is not Caking, she is producering tech teams at Magic Leap and thinking about what the interactive medium could look like in the future. Lover of food, she considers eating one of her hobbies and her favorite food to be whatever she is craving that moment. “I wish I could play SC custom games on my phone…” was the thought Naomi had when first considering making a game on her own. Naomi and Justin were carpooling to Blizzard one day when they began chatting about making a tower defense game and learning Unity while doing it. It was a great opportunity since they both shared a passion for strategy games and dreamt about one day being able to create content from anywhere in the world. 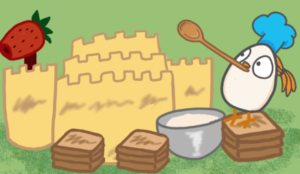 Naomi had some ideas for a fantastical food-themed world with castles made out of cake, and Justin had ideas he wanted to explore for a more strategic tower defense game that focused on mazing as a core mechanic. Shortly after leaving Blizzard, Naomi introduced Justin to Toli, a colleague that she worked with at Riot, and the 3 of them began baking Defend the Cake! Although the team originally started in Los Angeles – California, most of development has happened while each person resided in a different geographical location. The Defend the Cake team believes in the art of remote collaboration and being able to work on a project together regardless of geographical separation. Toli is currently in Los Angeles (CA), Justin in the San Francisco, Bay Area (CA) and sometimes on the road cross country, and Naomi in Fort Lauderdale (FL). 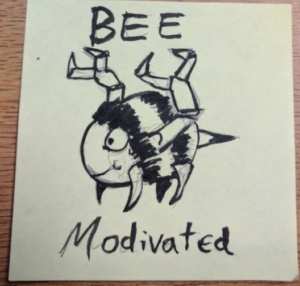 Bee Motivated! A peek into the Cake creative process. 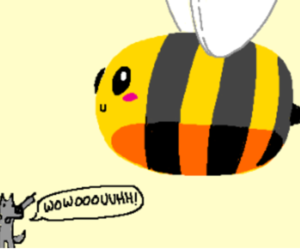 Bee Motivated for Game Development! Making games is hard work and everyone needs to be motivated to finish the project. How does an idea turn into a game asset on Defend the Cake??? It always starts with a completely organized and a professional brainstorming session, of course. 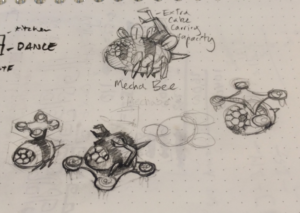 We’d like to kick-off our blog by giving you a peek into our very serious creative process for the upgraded (modded) bee. 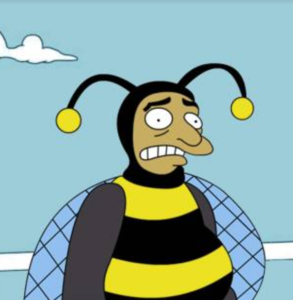 Justin: Level08 will introduce the Upgraded Bee. 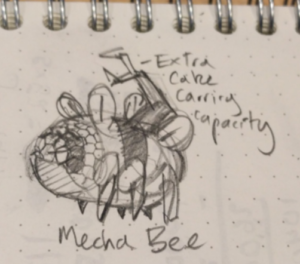 Mechanically, it needs to have more HP compared to a regular Bee, and I was thinking of making it so it picked up 2 slices of Cake, to give it a higher level of threat. 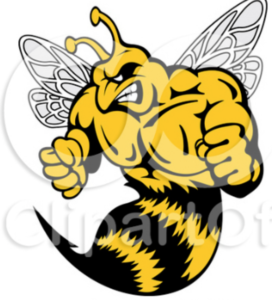 We need to flesh out what this upgraded bee is. IS IT EVEN A BEE!?? Toli : Something like the bro ant that is flying! Naomi: Are the bosses just juiced up versions of that bug? 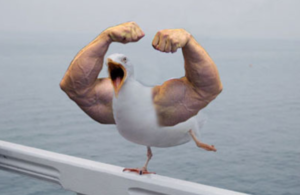 Justin: The birds with arms thing is funny, but we have already explored that direction with the Bro Ant; might be stronger if we had something more unique here. Naomi: that’s the silliness level i like for sure. Something needlessly teched out and silly…Cuz getting cake is THAT IMPORTANT…it requires decades of R&D to make a suit. I would like to see a noticeable tech escalation as the game progresses lol. Cuz every time the bugs are defeated, they go back underground to over-prepare. Justin:yeah, I like the idea of tech escalation. keep in mind though, that this is appearing at about the middle of the game, so we may not want to blow our tech load too hard here. 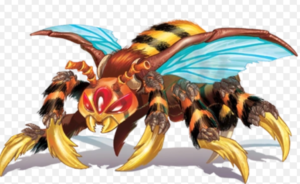 Maybe save the super mecha decked out thing for the queen ant? Naomi: it has been decided! Justin: The drone with a drone is a fun hit, so long as that can work with the walking back carrying 2 slices thing. 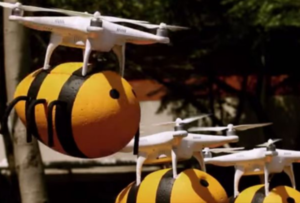 Naomi: will Bee Drone raise questions such as – a bee already flies so why does it need a drone to transport it?